Will Samsung give in to notched displays finally? Samsung’s Developer Conference has shown Samsung’s intention to move to notched displays in the future. The New Infinity could be limited to flagship smartphones while the notched designs could make it to more affordable handsets. Since Essential and Apple brought the notched display, every single manufacturer has adopted the design trend for maximising the viewing canvas. However, Samsung chose to stay out of the pack and maintained a uniform design language all across its smartphone lineup, including the flagship S and Note series phones. Now though, it seems that things are about to change and Samsung could be eventually giving in to the notch trend. At the Samsung Developer Conference, the company showed off various display notch implementations that they can technically use for commercial devices. 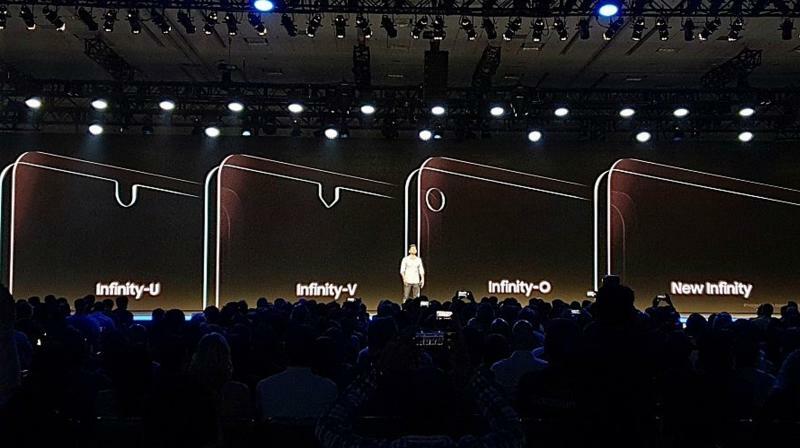 They showed an Infinity-U display with a ‘U’ shaped notch, an Infinity-V display with an edgy V-shaped notch and an Infinity-O design, which is essentially a circular housing for the camera pushed to one corner of the display. There was one more New Infinity display that showed a completely notch-less design similar to the panel we have seen on the Vivo NEX. There is no cutout in the panel, which means Samsung must have figured out a way to embed all sensors and notches under the display, hidden from the sight. The New Infinity could be limited to flagship smartphones while the notched designs could make it to more affordable handsets. Presently, Samsung is still following a uniform design approach by retaining the forehead and the chin on its handsets. The flagship models such as the Galaxy S9 and Note 9 offer curved edges to the sides, which help in maximising the display area while reducing the overall footprint of the device.